Pete Aragon, left, and his wife Alma, center, show Karen Tomky, a nurse practitioner who runs the Centennial Family Health Center, photos of their granddaughter after Alma’s medical examination on Nov. 15 in Ordway, Colo.
Doug Miller, a nurse practitioner who runs at the Rocky Ford Health Center, does a medical examination on Jeanne Smith on Nov. 16 in Rocky Ford, Colo.
Art Brubaker, left, a volunteer EMT for Crowley County Ambulance, and Justin Grafel, a volunteer driver for Crowley County Ambulance, take a resident who is having seizures to the ambulance on Nov. 14 in Ordway, Colo. Alfonso Rios, also a volunteer EMT, opens the door to the ambulance before heading to the hospital in La Junta. 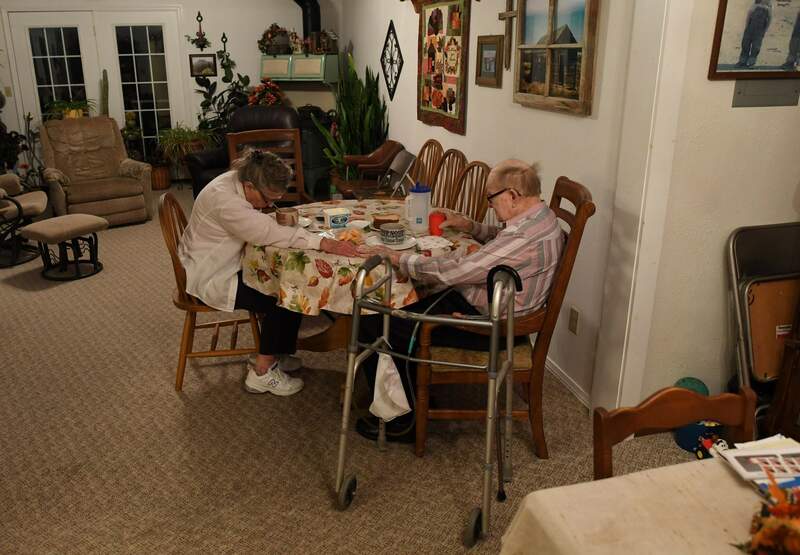 Mary May, 90, and her husband, James Gourley, 99, join hands as they pray before a meal on Nov. 13, in Two Buttes, Colo. James and Mary May still live on their own in rural Colorado. ORDWAY – Inside Karen Tomky’s small medical office, the fourth patient of the day lifted up his snap-button shirt to reveal a liver-colored smear of a bruise. Tomky, a nurse practitioner, looked at the bruise without alarm. In a career spent caring for one of Colorado’s poorest and most rural counties, Tomky is accustomed to surprises. On any given day, she might treat colds or broken bones or addiction or chronic disease. Patients have walked into her office in the midst of heart attacks or labor. One time, a farmer came in with an amputated finger, blood spurting across the tile floor. She grew up here in Crowley County, the daughter of a cattle rancher on the southeastern plains, but she didn’t intend to stay. She was working in Salt Lake City when she received a letter from the county’s doctor urging her to come home and join the doctor’s practice. There are no doctors in Crowley County anymore – typical of a drain of medical providers across rural America that has left people outside of metro areas with shorter life spans and higher rates of disease. Instead, over an expanse of 800 square miles, there is only Tomky and her small staff. Her days begin near dawn. Her lunch hours clutter with paperwork. Her phone sometimes buzzes in the middle of the night – because she’s the county coroner, too. And, in April, she turns 65. “Everybody around here knows my age,” she says. “So they keep asking me if I’m going to retire. Health care in rural America is ill. Dozens of studies have documented the symptoms: People who live in rural areas are more likely to die from heart disease, stroke, cancer, injuries, drug overdoses, car crashes and suicide. Women are more likely to die in childbirth. Children are more likely to die as infants. Dozens more studies have sought to diagnose the cause. 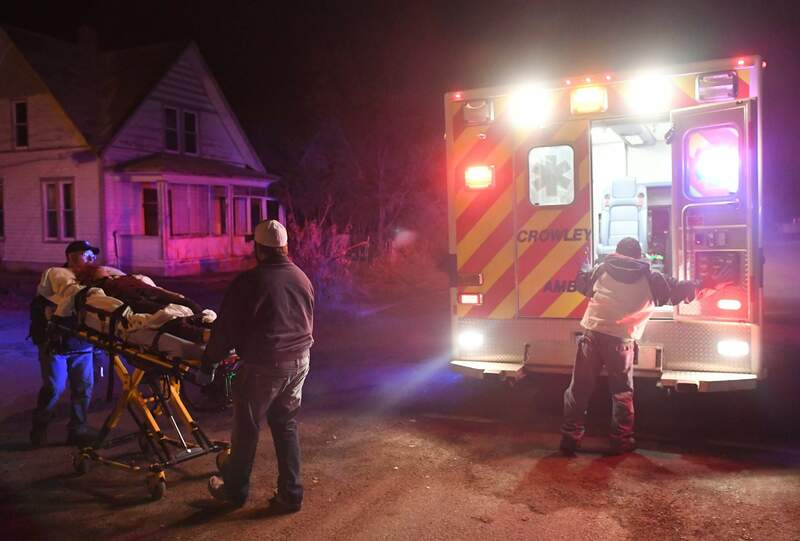 Rural areas generally have higher rates of smoking and poverty, lower quality of vegetables in the grocery store, and longer drive times to reach trauma care. But, mostly, the studies keep coming back to the same problem. There just aren’t enough doctors and other medical providers. Nationally, fewer than 10 percent of the nation’s physicians practice in a rural area – even though such areas hold 20 percent of the U.S. population. In Colorado, there are 13 counties – all rural – that do not have a hospital, including two without even a clinic. Two counties, including Crowley, don’t have a single doctor. When hospitals do have an opening for a new doctor, it can take years to recruit someone to take the job. The state has tried to come up with ways to fight the shortage. There is the Colorado Health Service Corps, a program that will help new doctors repay their medical school loans if they work in a rural or other underserved area. Hospitals in the metro area, too, have helped in their own way. Several large health systems in Denver have bought or struck up partnerships with rural hospitals – both saving some hospitals from closing but also reducing local control in longtime rural community institutions. Teams of doctors and nurses will sometimes venture out from the city to hold office hours at rural clinics. A cardiologist visits every other Wednesday at the clinic in Del Norte. A neurologist visits the hospital in Burlington on the second Monday of every month. And urban hospitals have also expanded their “telehealth” systems, allowing patients in rural areas to meet with a specialist via video conference without ever leaving their home, provided there is strong enough internet service in their region. Some hospitals, including Children’s Hospital Colorado, have established so-called “locum tenens” services, essentially medical temp agencies that provide doctors who can fill in when physicians in rural areas need a break. The service at Children’s has provided coverage for more than 100 rural practices around the state, said Dr. Steven Poole, the physician who oversees the service. But perhaps the greatest hope for curing the shortage is a thin, former country doctor sitting in a cluttered office on the University of Colorado’s Anschutz Medical Campus. Dr. Mark Deutchman, a professor at the University of Colorado School of Medicine, runs what is plainly called the school’s Rural Track. The program takes about 20 students per medical school class and prepares them to work in rural settings. That means giving them early clinical experience in out-of-the-way places – where they must quickly learn to do more themselves because there are fewer specialists to refer patients to. But it also means teaching them about navigating small-town life, where patients are neighbors. “If you didn’t want to be friends with your patients, you’d never have friends,” Deutchman said. The program especially tries to recruit students who are from small towns and rural areas, and everyone who participates in the program must write an essay about why they are interested in working in rural health care. Some hospitals, including Lamar’s, sponsor scholarships for students in the Rural Track, waiting as long as seven years for students to get through medical school and residency before they go to work at the hospital. So far, the Rural Track has graduated more than 130 new doctors. But, of those who have made it through residency and are in practice, fewer than half are actually working in rural settings. Life often intervenes, Deutchman said. Students get married, have children and develop ties to the city. Some become interested in specialty practices. Statewide, fewer than 40 percent of rural doctors remain in the same community for longer than five years. It speaks to the challenge of being a rural doctor. Even those most interested in serving small communities can’t always make it work to get there – or to stay. The first patient of the morning at Doug Miller’s clinic in Rocky Ford was a regular, and they quickly slipped into banter. Jeanne Smith asked Miller about a new medicine. “Am . de . fer . – however you say it,” she said. “Omeprazole?” Miller said, then took her blood pressure. “So, with the new guidelines, you’re right there,” he told Smith. “You know what does that? Sweeping. Best exercise on the planet,” she shot back. 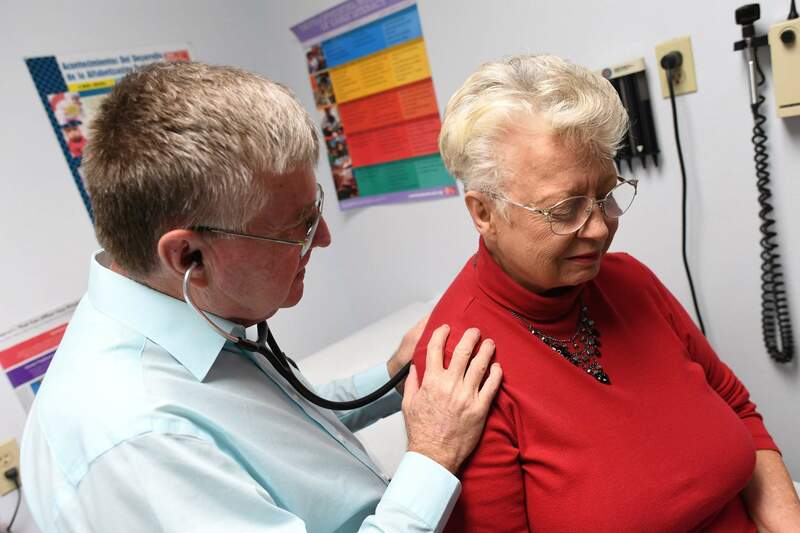 Like Tomky, 13 miles to the north, Miller is a nurse practitioner – meaning he has training over and above what a registered nurse receives, can prescribe medication and can do most of what a doctor does but hasn’t been to medical school. As a solution to the doctor shortage in rural Colorado, he and Tomky pushed years ago for changes to state laws that would allow nurse practitioners to own medical practices and operate with greater autonomy. And now, also like Tomky, he is fast approaching retirement with no clear succession plan for his practice. Which, to Smith, sounded all too soon. Even now, Miller said, he can feel the stress of running his own practice mounting. New requirements for electronic medical records add to his costs and take away staff time, while higher standards for treating patients mean that he spends more worthwhile time with each but can’t see as many in a day. At one time, Miller said he had a semi-retired doctor working with him at the practice. But then the man had a heart attack on his lunch break and died. For the past three years, Miller has had another nurse practitioner, Heather Elliott, working alongside him. Still, the demand grows. A family doctor in nearby La Junta, Dr. Marion Lee Schmucker, died in August after a battle with cancer, leaving thousands of patients in the Arkansas Valley without a medical provider. Elliott grew up in Seattle but married a man from the valley, making her the rare urban practitioner who chose to move to a rural setting. She said she loves working in a small town, feeling like a needed part of the community. But asked whether she would want to own her own practice one day, she hesitated. Late November was one of the last days at Schmucker’s offices. He had practiced medicine in La Junta for nearly 40 years and, by his staff’s estimates, delivered 6,000 babies. He worked nights. Weekends. He sometimes slept at the hospital. His only vacation every year was to go hunting with his sons. Prior to Schmucker’s death, his family had tried to arrange a deal to keep the practice open under a nurse practitioner. But then the deal fell through, and the family announced the practice would close, leaving La Junta with one fewer place to receive care. She smudged a tear with her fingers. “They don’t know what it’s like to live in a small town because I think they would like it,” she said. There are still a handful of doctors in La Junta, Ramirez said. There’s the hospital and another longtime family medicine doctor, she said. And there’s a clinic with obstetricians and other specialists, although it sometimes has a reputation for high turnover among young doctors. But it’s hard not to view the loss of a doctor such as Schmucker in a more symbolic sense. Rural areas have lagged behind in recovering from the recession. Jobs – and people – have moved to cities. And, now, one more person who made La Junta feel like a special community is gone, too.